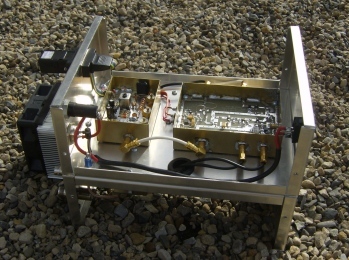 My 23cms radio consists of a homebrew transverter built from modular kits produced by Mark Kilmier VK5EME, driven by an Icom IC-290D VHF all mode transceiver. 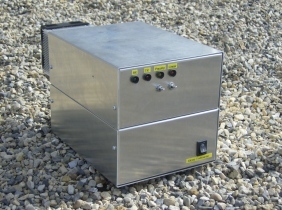 The transverter produces about 14W at 1296Mhz with about 0.5w drive and includes full sequencing to switch both an external preamp and linear. 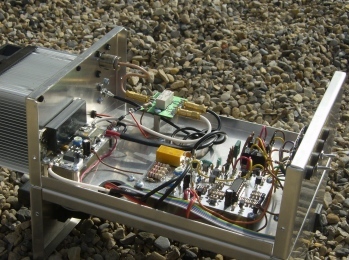 My QTH doesn't really suit 23cms activity but I do on occasion hear the GB3ANG beacon. My aerial isn't the best but I decided on a gain/beamwidth compromise and have a Sandpiper 19 element yagi fed from the shack to just below the rotator with LDF5-50 heliax.